​Although stocked trout might be easier to catch than a wild trout they can still offer great fishing. They are perfect for an easy day out on the water or as an excellent way to introduce children to their first fishing experience. Just because a trout has been stocked doesn't always mean it will be easy to catch. 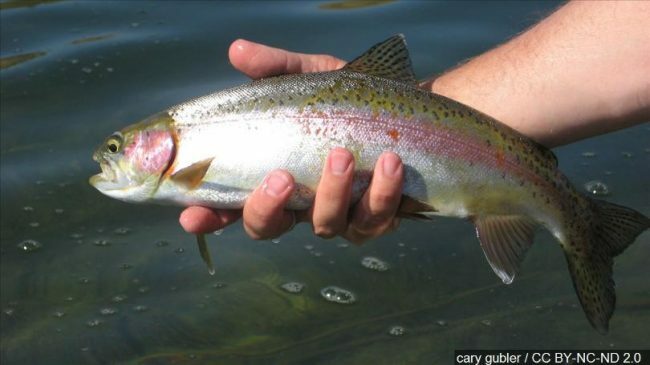 The longer a trout has been out in the wild the harder it will be to get it to take a bait. ​The best baits to use for stocked trout can be powerbait, nightcrawlers or meal worms, corn or salmon eggs. ​Berkley Powerbait is a scented dough like substance that comes in a range of different scents and colors. It is extremely effective at catching stocked rainbow trout. All you need is to roll a small piece into a ball and press it onto your hook. There is a big range of very bright artificial looking colors.The range has evolved over several years with the different colors and scents having been well researched and improved upon over time. One reason why it is so effective is that once it is squeezed onto your hook it may well resemble the types of food pellets that stocked trout are reared on in the hatchery. This is probably why it works so well for freshly stocked trout. ​Nightcrawlers or any other kind of worms are probably what most people start fishing with as a kid. Dig them up in your back yard and store them in a tin in some earth and you have a ready to go, super effective bait that catches just about any small freshwater fish. Meal worms can be purchased at any good bait and tackle store. They are smaller than regular nightcrawlers but can be just as effective. You can also get them dyed and scented or you can ad your own. They can be stored for up to a week in the right conditions. And if you really like them you can also start a worm farm in your back yard so you have a constant supply. Corn is one of those baits that doesn't really make sense. But, it sure can be a killer for stocked rainbow trout. All you need is one or two pieces of sweet corn from a can on your hook and it's good to go. You can also combine a piece of corn with a worm on the same hook. This gives you the color and smell of the corn combined with the natural movement of the worm. Salmon eggs are made by a variety of companies but the best known brands are probably Pautzke and Powerbait eggs from Berkley. Red is the go to color of choice and can be fished on very light gear and small hooks. One important point to make is that salmon eggs are very soft and can fly off the hook if your cast is too aggressive. They can keep for months on end once the jar is opened so a single jar that is cheap to buy can last a very long time. ​Bottom fishing with weight is about as simple as it can get. Cast your bait to where you think the trout might be lying and then wait for a bite. just be careful to only use enough weight that is needed. If you can try to rely on the weight if the bait itself as this will give a much more natural presentation. When fishing with a float or bobber you can fine tune the deth at which the bait will sink to. Fishing with a float is one of the best methods you can use on a slow moving river as it allows you to cover a lot of the river by merely casting upstream and allowing the bait to move down naturally with the river current. ​Freshly stocked trout will usually be easier to catch than an aged on. All of the above baits should work. If you happen to know what they were fed on whilst being raised then you can try to match your bait to that. Using a selection of different baits is usually the best trick. Once you know what they are taking it is just a question of getting the bait in front of their noses and they will probably be not that picky. Aged trout however do become a little harder to catch. They will start to feed on more natural foods found in the river or lake. Small insects and nymphs will generally be what is available so you may need to change your bait to some of the more natural ones like worms or even a small trout jig that has a natural pattern to it. Given that most stocked fish will be small your tackle choices should fall in the light to ultralight bracket. Stocked trout will generally not run that hard or have any where near as much power as a wild trout. You need light gear so as not to rip there lips. From experience I can say that they do tend to have softer mouths. This combined with their light weights means using a very light drag setting. You will need a spinning setup and not a baitcasting one as the tackle you will be using will be very light. ​Rod - Ultralight trout rod, roughly 6.5 feet in length with a fast action. Reel - A size 1000 to 2500 spinning reel. Line - Somewhere between 2 to 6 pound monofilament. Copyright © 2019 Lake Ontario Outdoors | Theme by SiteOrigin.